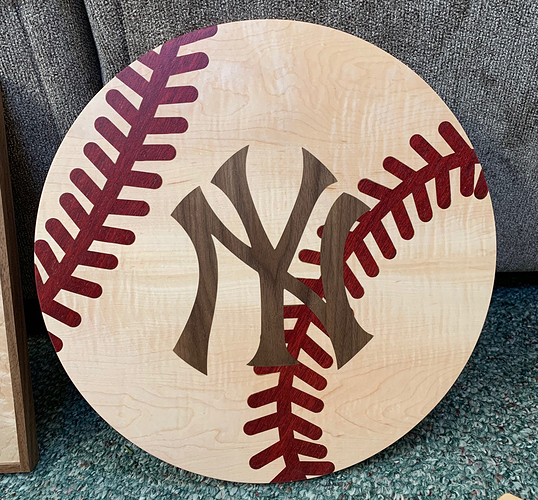 14" diameter Baseball with v-carved stitches and logo inlays. First time doing v-carve inlays and I messed up so much in the process. I forgot to put the probe on top of the material when I switched to my v-bit and ended up carving deeper than expected. Didn’t realized until after I carved out the first set of stitches and they were far too small. Took me quite a while to finally realize where I had gone wrong. Luckily was able to compensate and salvage the project. Second mess up was that when I glued the first logo in, my piece bowed from the clamps and when they released it popped out of place. Had to carve it out and do it again and managed to get it done just in time for Christmas. I like that you made a few mistakes along the way, that sounds a lot like my big projects!